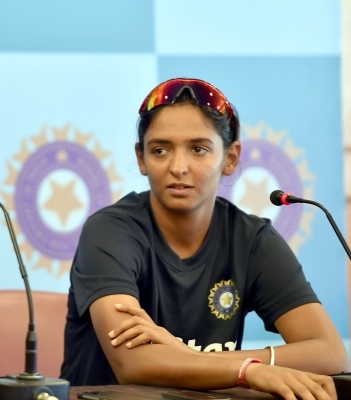 London, July 22 (IANS) On the eve of Sunday’s ICC Women’s World Cup final at Lord’s here against India, former England men’s team skipper Nasser Hussain advised the hosts not to employ spinners against all-rounder Harmanpreet Kaur, who smacked a 115-ball unbeaten 171 against Australia to help the women-in-blue reach the summit clash. Kaur’s sensational hitting in Thursday’s second semi-final at Derby sent Australia packing with a 36-run loss and set the alarm bells ringing for the hosts, who are eyeing their fourth World Cup triumph. The 49-year-old former England captain advised the eves to control the power-hitting of Kaur by avoiding spinners against her, if they are to win the title. “My only advice to captain (Heather) Knight would be not to bowl spin when Kaur comes in because she absolutely smacked it against the Aussies at Derby on Thursday. Keep her quiet and England should be in business,” Hussain wrote in his column for the Daily Mail. While Hussain predicted an English win on Sunday, citing more depth in the home side, he also cautioned them against any complacency, given that India are the only side to beat England in the group stages of the tournament. “Sunday’s final should be a cracking affair, with India being the only side to have beaten England in this tournament,” he wrote. “India have been the sleeping giant of the women’s game but they have awoken now and that could be hugely significant for the sport, just as Mahendra Singh Dhoni’s win in the 2007 World Twenty20 was arguably the making of the short game. “I just fancy England at Lord’s, even though India have had an exceptional tournament to get this far. Heather Knight’s side have more depth and I think their advance to the final has been a genuine all-round team effort,” he added. Besides Kaur, Hussain also hailed India skipper Mithali Raj and opener Smriti Mandhana, who have been impressive in the tournament. “Three Indian batters in particular have caught my eye: opener Smriti Mandhana, who made a silky 90 against England in the first game; Mithali Raj, who has always been a good player; and then Harmanpreet, who made an incredible 171 off 115 balls against Australia in the semi-final,” he wrote. This is India’s second entry into the Women’s World Cup, having lost to Australia in their first attempt in 2005 at Centurion.